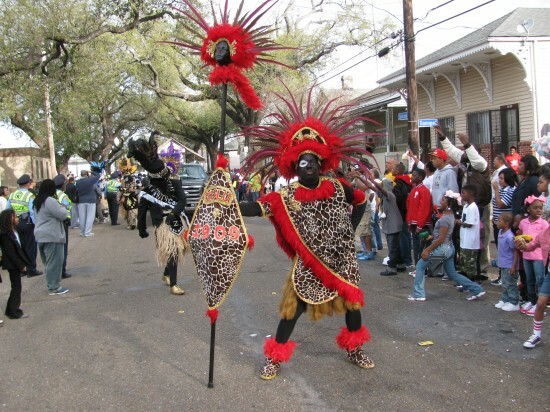 The plan, which was gone over in Part 1, was to get to New Orleans early and be on Jackson Avenue for the whole of Zulu. 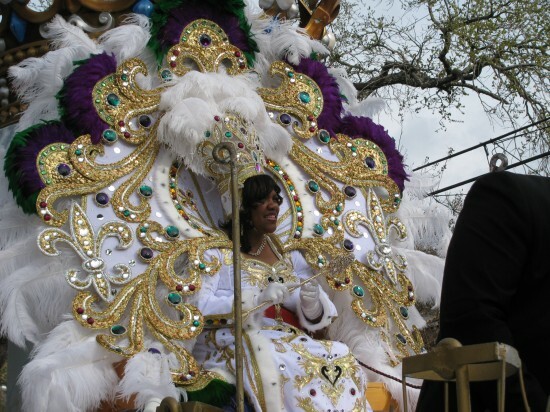 Here leading the Zulu parade is New Orleans Mayor Mitch Landreiu, his daddy Moon was mayor, his sister Mary is a Louisiana Congresswoman. 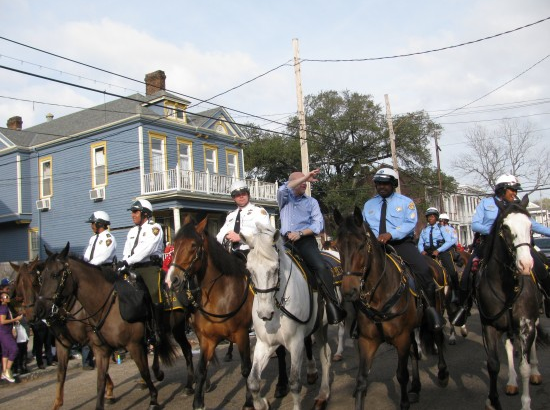 He’s surrounded by a phalanx of New Orleans police. 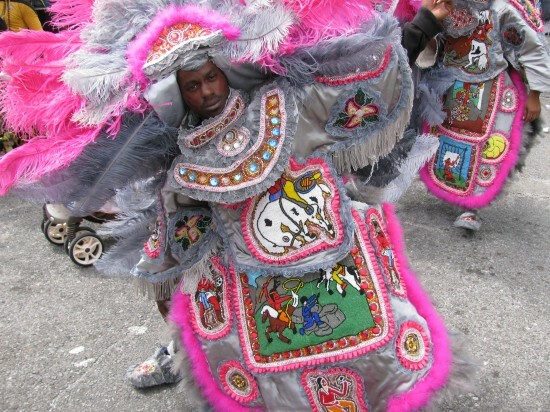 He rides to Gallier Hall on St. Charles Avenue in the Central Business District, dismounts and greets Rex there following Zulu. If you look closely at the brass band with Zulu video in the first post, you’ll see this guy at the very end. I did too, switched from video to still, jumped out in the street, he posed and i got this shot. 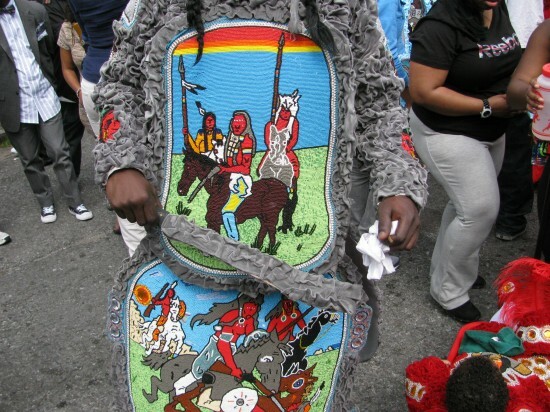 Queen Zulu 2012. I got a better shot of her than the King, she’s prettier too. Here’s another old Mardi Gras tradition, these are Baby Dolls and dressed in the classic sense. I first read about the Baby Dolls in Gumbo Ya Ya, a collection of Louisiana folk tales put together as a WPA Writer’s Project in the late 30s-early 40s. This is the rest of their group, all parading as the New Orleans Baby Doll Ladies. The thing that gets me is the “porcelin” mask face paint, some of the best face painting i’ve seen. They were stopped at our parade position for a good while and i got a number of good shots. They did a dance routine that some members of the crowd jumped in and joined. Mayhaps i should post that video also. The street was rockin. 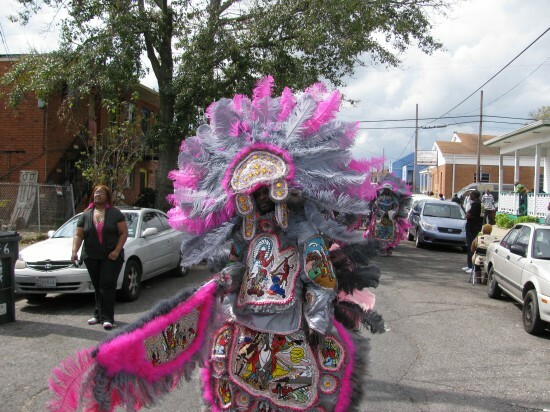 More floats pass, more beads caught, more bands play, then the last float passes and it’s time to head over to chase Indians in the street…….. The four pictures were taken at 2nd and Dryades three or so blocks over from Jackson Avenue near the former H&R bar and the present Sportman’s Lounge, an Uptown meeting/coming out place for the Uptown Indians. Their suits are mostly flat with multiple panels each with different beadwork. The suits are all hand sewn with beads, rhinestones and feathers, the competition being to see who’s the prettiest…and in some case wildest. Many thousands of hours are put in to get these end results. 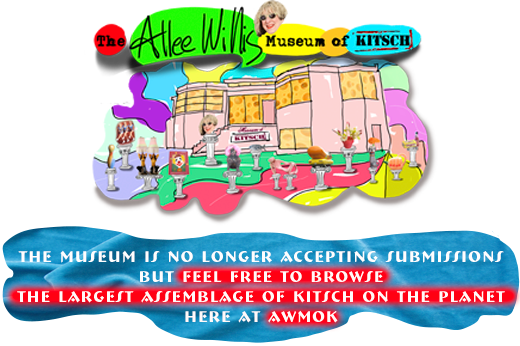 Whole families and their friends are enlisted to sew, sew, sew. It pretty much takes the whole year to do a suit as it’s not, shall we say kosher, to reuse patches. It takes a good bit of stamina and a whole lotta beer to be able to wear these, the headdresses alone can weigh 40-60 pounds. The suits are a bit warm as well as heavy and it was a warm Mardi Gras Day this year. 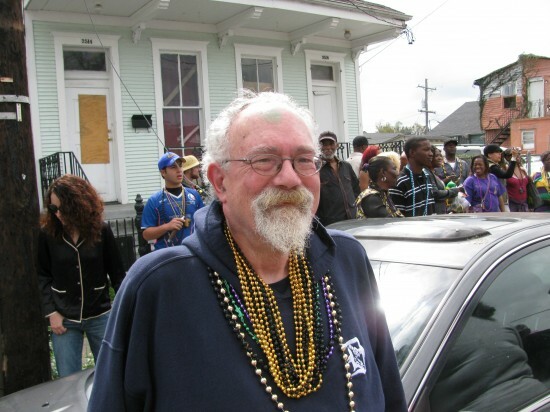 You Detroit natives might recognize this man, John Sinclair of Amsterdam/Detroit/New Orleans. He’s still the only person i know that’s had a song written about him by John Lennon. 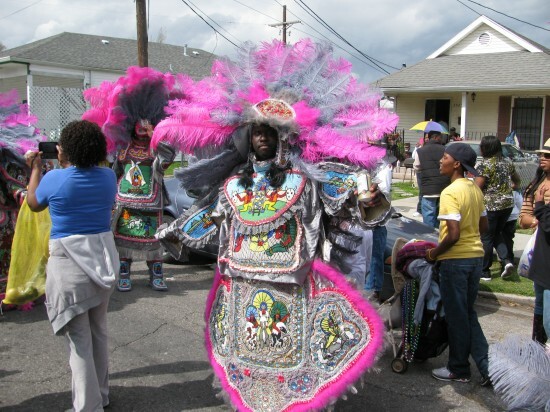 John comes back to New Orleans for Mardi Gras and Jazz Fest and i usually see him down at 2nd and Dryades on Mardi Gras Day after Zulu to catch some Indians also. He’s been the founder of the White Panther party, manager of the MC5, is a fine poet, great musician and the most knowledgeable person i know about blues and jazz as well as a great radio dj and all around radical. 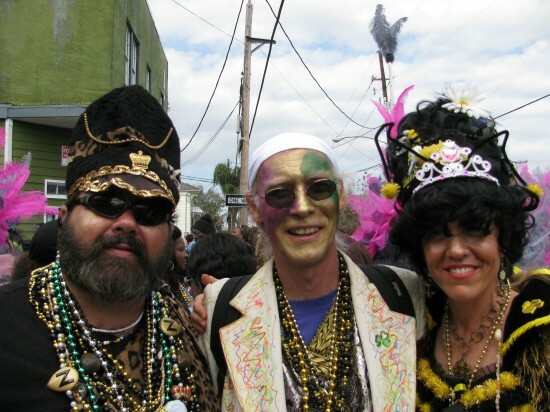 And we’ll leave you with this picture of the folks missing from last years Mardi Gras post. Left to right are Renee, Bill and Renee’s wife Donata. They always come up with great costumes, their kids too, in the fine family tradition of all dressing similar. They had an invite to a kush location last year and didn’t make the Jackson Avenue scene. I was pleased to see them this year. 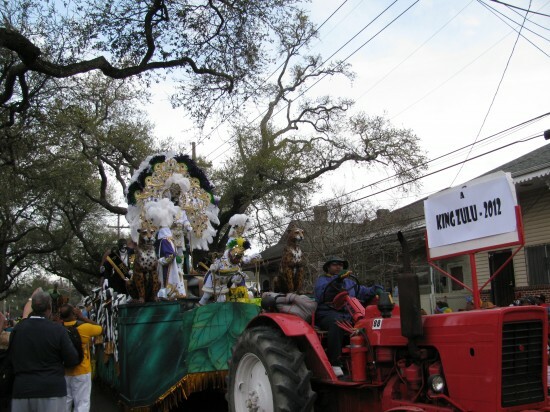 All on a Mardi Gras Day….stay tuned for Part 3, Rex and more crazy costumes….as well as a separate post on our Baton Rouge Krewe Of Southdowns 25th Anniversary Silver Jubilee…………. 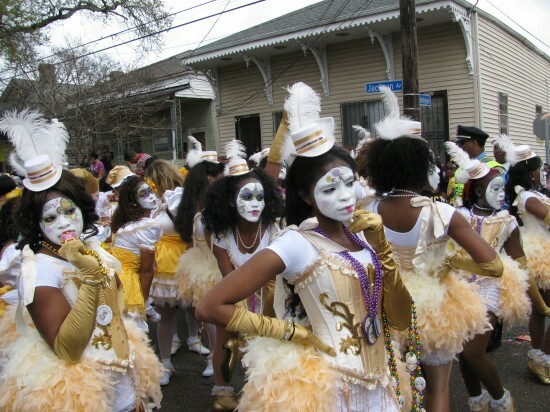 LOVE these MArdi Gras posts of yours. It’s insane that I’ve never been to MG. Especially as I see your photos. You know I’ve never even been to New Orleans? I’m not a traveler in general but between the celebration, food, costumes and funkiness it’s sinful I’ve never experienced any of it. Thank you Allee for the Classique d’Camembert! 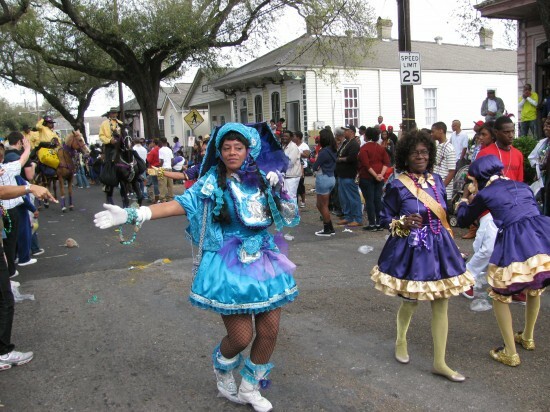 The third part will follow shorly bringing our Mardi Gras Day adventure to a close so stay tuned…. Wow , so colourful and looks great fun, Queen Zulu is super fabulous and I want her outfit. Really interesting post. I love your mardi gras posts! The baby dolls, what an interesting group.